I created this sauce for my St. Patty's Day broiled lamb chops, but it turned out to be so good that I think it warrants its own post. It has a good balance of sweet and savory, but maintains the unmistakable flavor of Guinness®. My kids even liked it, which is a great testimony for an on-the-fly recipe. Heat the pan over medium heat, add the remaining ingredients, and whisk to combine. Simmer until the sauce is reduced by half (about 15-20 minutes) and set aside to cool. Brush it on your carnage of choice during the last 5-10 minutes of cooking. I have missed your site and amazing food! John, I've been making the BBQ Pit Boys Grilled Chicken with Vodka Sauce, then problem is my wife is not a fan of the Vodka Sauce .... 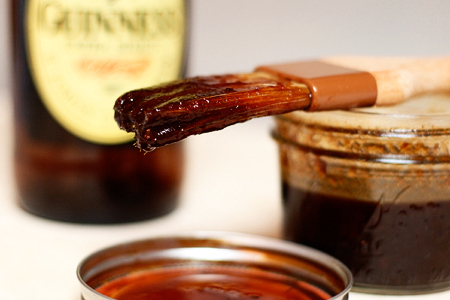 Enter Guinness BBQ Sauce, I got two thumbs up tonight. Thanks for a great sauce, I'm sure hhis will be great on all kinds of meat. I had to add corn starch to thicken it up. I followed the recipe to the letter, but couldn't get it to thicken. But it is WONDERFUL! Very yummy on Chicken Wings! What can I use as a substitute for the Pickapeppa? Can't find it and want to try it this weekend. Oriley - You can substitute 2 tsp of your favorite hot sauce and 1 tsp A-1 steak sauce. Just made it! Improvised a little and used a local Bourbon Barrel Stout and used my favorite local hot sauce instead of Picapeppa. I also added a teeny bit of ground chipotle and a couple of tablespoons of tomato paste. Delicious!! It's a Christmas gift for my dad. I'm sure he'll love it!